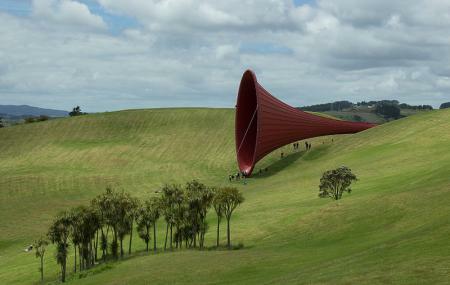 The Alan Gibbs Farm redefines art with sculptures that create a parallel universe over a majestic area of 1000 acres! Witness a variety of interpretation art that uses metal, electricity, light, space, shapes, colours and natural elements to create a heady mix of sculptures and new age art pieces. The range of artists that find home for their art piecesat the farm, is outstanding. With so much variety to offer for art lovers, a visit here is not just an experience- it is a revelation! Visiting hours are from 10:00am to 2:00pm on visitor days given on the official website. Gibbs Farm is not open for visits during the wet, winter months. Gibbs Farm is a private property open monthly by prior appointment only to artists, educational institutions, charities and the public. You can call up the place for prior bookings. How popular is Gibbs Farm? People normally club together Auckland Town Hall and Sky Tower while planning their visit to Gibbs Farm. People also prefer to start their day with Gibbs Farm. This place is amazing and very special that is not open to the public full time. I had liked the Facebook page to be able to catch when events were going to go on sale and that’s how I managed to get tickets! The place is as incredible as it looks in photos with loads of great animals. We were the when the weather was fine and, so, found it a beautiful and enjoyable experience. The sculptures, animals and views were interesting and engaging. Allow for at least 2 hours (or 4 hours if at a leisurely pace) to get around to all the sights. Highly recommended. An extraordinary collection of large scale sculptures by renowned international artists set in a beautiful rolling landscape on the edge of a large natural harbour. Throw in a few assorted exotic animals and you've got a pretty surreal, and pretty mind bogglingly wonderful day out. Definitely worth a visit if tickets can be obtained. Fantastic spot for a fun afternoon out. If I could give it 6 stars I would! Highly recommend heading along if you’re ever lucky enough to get tickets.